1. Hertford RFC acknowledges its' responsibility to safeguard the welfare of all children, young people and vulnerable adults involved in Hertford RFC from harm. Hertford RFC confirms that it adheres to the Rugby Football Union's Safeguarding Policy. This policy should be read in conjunction with that Policy and does not replace nor supercede it. 2. A child or young person is anyone under the age of 18 engaged in any rugby union activity. Where a 17 year old player is playing in the adult game every reasonable precaution will be taken to ensure their safety and wellbeing are also protected. d. Working in partnership with other organisations, statutory agencies, parents, carers, children and young people is essential for the welfare of children and young people. 4. Hertford RFC recognises that all children and young people have the right to participate in sport in a safe, positive and enjoyable environment whilst at the same time being protected from abuse, neglect, harm and poor practice. 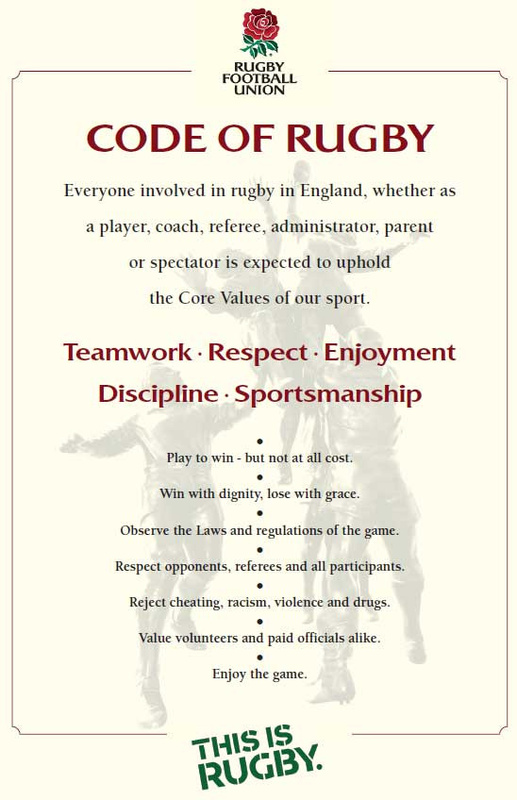 Hertford RFC recognises that this is the responsibility of everyone involved, in whatever capacity, at the Club. 6. Hertford RFC follows the RFU Guidance for Websites, Online and Mobile Communications as set out on the RFU website. RFU Guidelines are attached in Appendix B: Photographic Policy. 7. Hertford RFC Photographic Policy is published on the Club website and in Appendix C: Hertford RFC follows the RFU Photographic Policy recommendations and Best Practice guidelines. Incident Reporting. 8. The Club Safeguarding Officer and Assistant Safeguarding Officers are published on Club Noticeboards, in the Club Yearbook and in the Contacts and Safeguarding sections of the Club Website. Anyone witnessing or aware of an incident where the welfare of a child, young person or vulnerable adult has been put at risk must in the first instance inform the Club Safeguarding Officer or an Assistant Safeguarding Officer. If an incident involves the Club Safeguarding Officer the Club Chairman should be informed and also either the Herts RFU Safeguarding Manager or the RFU Safeguarding Executive. The chart in Appendix E provides guidance on who to contact and in what circumstances. An incident reporting form can be downloaded below. 9. All members of Hertford RFC who have a regular supervisory contact with children or a management responsibility for those working with children must undertake an RFU Disclosure and Barring Service (DBS) check. It is a criminal offence to work with children unsupervised without such a check. Wondering whether you need a check? In short, if you are working with children or young people more than once per week or 4 or more times in a 30 day period, you need a check. This DBS Eligibility Decision Flowchart should help. If in doubt, please contact the Club Safeguarding officers for advice. h. Having an intimate or sexual relationship with any child, young person or vulnerable adult developed as a result of being in a “position of trust"
i. Making sexually explicit comments or sharing sexually explicit material. 11. Hertford RFC ensures all its' coaches, parents, officials and spectators are aware that adults must not use the changing facilities at the same time as children, young people or vulnerable adults. 12. Adults must only enter changing rooms when absolutely necessary due to poor behaviour, injury or illness. Adults must only ever enter the changing rooms by themselves in an emergency and when waiting for another adult could result in harm to a child. If children need supervising in changing rooms, or coaches or managers need to carry out a range of tasks in that environment this must involve two DBS checked individuals of the same gender as the children. 13. No pressure should be placed on young people who feel uncomfortable changing or showering with others, if this is the case they should be allowed to shower or change at home. 14. Hertford RFC will provide its coaches and volunteers with the support and safeguarding training required for their position and role. Coaches and Volunteers must ensure they attend this training. 15. Any events held on Hertford RFC premises must comply with this Policy and if appropriate a Safeguarding Plan specific to that event should be discussed and circulated to those affected. 16. Any tours, overseas or domestic, undertaken by Hertford RFC must comply with the relevant RFU Regulations and Guidance relating to tours. All Tours must be notified to the RFU in advance and all overseas tours require RFU approval in advance. Tour organisers should contact the Club Safeguarding Officer in the first instance. 17. Hertford RFC has adopted the RFU’s Anti–Bullying policy. This can be viewed on the RFU website at www.rfu.com. 18. The welfare of children at Hertford RFC will only be protected properly if this policy is implemented effectively. 19. Hertford RFC have designated individuals with child protection responsibility. Their names and contact details are on the Club’s website and on display in the Clubhouse. The full Policy and it's appendices can be downloaded below.